Port of San Diego will also look into proposals for marine debris removal and bilge sensing. 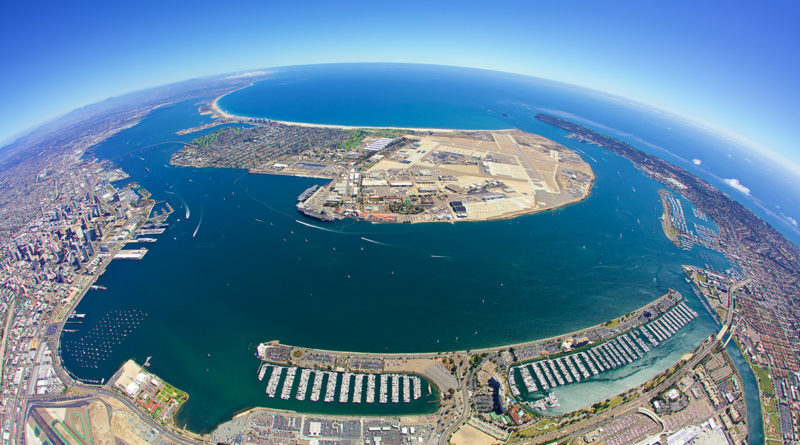 SAN DIEGO — A quartet of green pilot projects are receiving serious consideration by the Port of San Diego, with hopes of fostering expansion in offshore aquaculture, marine debris management, oil spill forecasting and ocean monitoring. Commissioners were presented with four pilot program proposals at their Oct. 10 meeting. The proposals addressed marine debris removal, ocean monitoring, offshore aquaculture and oil sensor technologies. Port district staff received 15 proposals, in all, during its most recent competitive review process, which includes a vetting period, strategic review of the proposed plan and a negotiation period. The Port of San Diego has been seeking opportunities in blue economy and aquaculture since 2015, all as part of an attempt to promote local fisheries and make advances in environmental progress. The port district’s blue economy sector focuses on four industries: coastal development; commercial fishing and recreational activities; shipbuilding and boatyards; and, cargo/cruise ships. “Our vision is to build a sustainable blue economy portfolio of new partners who can divert multiple benefits to the region,” Blue Technology Program Manager Philippe LeBlanc told port commissioners. Rose Canyon Fisheries has been seeking to build an offshore aquaculture operation, just beyond San Diego’s coast, for several years and hopes to work with the port district to bring such plans online. The port district would assist Rose Canyon Fisheries, which is led by Hubbs SeaWorld Research Institute, in securing permits for the planned offshore, commercial-scale aquaculture venue. The need to pursue and implement blue economy and aquaculture opportunities is due to the United States’ trade deficit and heavy reliance on imported seafood, according to Paula Sylvia, the port district’s program manager for aquaculture and blue tech. Sylvia added aquaculture contributes to about 50 percent of the seafood supply worldwide. Fostering an aquaculture economy at the Port of San Diego, according to Sylvia, would support several opportunities, such as fisheries enhancements, biofuel and food production, and ecotourism. Commissioner Dan Malcolm told colleagues the port district could be a leader in offshore aquaculture opportunities and foster a stronger fishery economy. One pilot program seeks to develop a custom-made vessel capable of removing marine debris from the water. Zephyr Debris Removal would use skimming technology to help keep a portion of San Diego free of disposed trash. “The Zephyr vessel features unique custom skimming technology designed to solve a variety of logistical hurdles for efficient marine debris removal, including removal of small debris, and access to shallow and rough water,” port district staff stated in a report to commissioners. Zephyr’s pilot program would be for one year. “The pilot project will collect validation data based on key variables influencing marine debris accumulation and removal (e.g. weather events, tidal swings),” port district staff stated. Commissioners agreed to negotiate a pilot program accord with Zephyr. A wireless technology provider, according to port district staff, had developed a patent pending oil and fuel detection sensor capable of detecting and preventing oil spills from a vessel’s bilge. Blue Guard Innovations, or BGI, would operate a two-year pilot project to test the sensor technology in San Diego Bay. Port district staff and BGI will negotiate an agreement to move forward with the pilot program proposal. The port district would receive royalties on future BGI revenue in exchange for providing permit rights, pilot coordination and equipment use. San Francisco-based technology startup Spoondrift Technologies developed a buoy to collect and share ocean data in hopes of improving forecasting. “Spoondrift technology is designed around simplicity and scalability to provide solutions for a more connected ocean and to open ocean data and provide shared access amongst many users,” port district staff explained in its report to commissioners. The data collected by Spoondrift’s multiple buoys would be available in real-time to recreational users and tourists. Commissioners directed port district staff to continue performing due diligence before negotiating any agreements with Spoondrift. Four incubator projects were already vetted and approved by port district staff and commissioners. The pilot programs, approved by commissioners in June, aimed to develop a smart marina application, drive-in boat wash, copper remediation tool and oyster nursery. The next round of pilot project proposals are all aquaculture themed, focusing on microalgae technology, ocean farmed seaweed, sustainable seaweed and water treatment production. ← Will Avalon’s South Beach have more sand by next summer?